The elephant in the room* is a colourful and evocative phrase that I rather like, but one which is rarely appropriate. Here, for once, I am happy to say that it is. The elephant is, of course, Blood Bowl. It was obvious from the outset that whatever DreadBall was or was not, it would be compared to GW’s Blood Bowl. Whether this was going to be favourable or not depended on the individual, but compared it would certainly be. This is exactly what is happening now, and so I would like to take a few moments to discuss the similarities and differences from my point of view as designer, and explain my decisions and talk a bit about where the concept for DB came from. Firstly, let me say that DreadBall is very deliberately, NOT a Blood Bowl clone. I cannot stress that strongly enough. Regular readers of my ramblings will know that I always start a design by writing a brief for myself. This helps crystallise the key points to bring out in a design, and gives you a reference point to return to if things need adding or trimming later to keep you on track. The first point on my brief was that DB should not be like BB. 1) Blood Bowl is a great game. I might even say it’s a classic. Certainly it has been around for 25 years and has a vast amount of nostalgic good feeling attached to it for many, many gamers. You cannot compete with nostalgia, so attempting to do a better version of BB (ie fantasy American football) was inevitably doomed to failure. Setting out to produce a failure is stupid, and as a I try not to be stupid** I wanted to avoid this. 2) Copying things is boring. Making stuff up is fun. Fun wins. 3) I have some pride. Or perhaps it’s arrogance, or ego or whatever. Whatever you want to call it, I like to think that I am quite good at this game design lark, and so I don’t need to copy someone else as a crutch for my inability. I can design something that is good in its own right as well as containing some unusual and inventive bits. 4) People deserve better. As a gamer, what would I want? Same again or something new and cool? What I think I really want is something that I didn’t know I wanted till I played it. If you see what I mean. A fun surprise. And in design terms that means sticking your neck out and trying something a little different. So there are a lot of reasons not to try copying something as well known and as popular as Blood Bowl. Of course, the brief had lots of other things in too, and I’ll talk about that another time. For now, let’s get back to the elephant. There are some similarities between the two. To start with, they are both board games that use dice and miniatures. They are also both about fictional sports (one fantasy, and one SF) that use balls. In other words they fall into a similar category. That doesn’t make them the same thing though. If it did then you could equally say that Snap was the same as Bridge because they are both card games, and that would clearly be silly. There are a few detail similarities – reality modelling ones. For example, you can throw the ball in both games. It’s true that it’s harder to throw a ball a long way than a short one in both games too, but that’s just reality for you and would be odd any other way. Both games have league rules (like real sports) and players can get better with experience (just like real people do). In both game you lose control of your Rush (turn) if you drop the ball. Again, this is generally what happens if you lose the ball in a real sport – the other guys get the initiative, which is what a game turn is effectively representing in almost any game. What I’m trying to say here is simply that the things that are most similar are all a function of modelling a similar reality. It is harder to throw a ball accurately if the target is further away. People learn new skills with experience. And so on. That is therefore true in both games, but it doesn’t make the games the same. I’ll just mention a few key ones here. Mechanically they are totally different. See the thread here for more discussion of rule details in DB. How you activate models and how much you can do with them in a turn is very different. A DreadBall turn is called a Rush. In a Rush a Coach gets 5 Team Action Tokens. These can be spent as he wishes, each one activating a single model of the 6 players on the pitch. There are a number of different actions to choose from, and different players have access to different ones and do some of the same ones differently. With this flexibility a single model may act up to two times with Action Tokens (and more if he wins Free Actions or plays cards) in a single turn. It is the choice of the Coach. Obviously with 5 Actions and 6 players, some of them will have to miss out. Who will that be? Decisions, decisions. Compare this to Blood Bowl where each model acts once a turn. There is no tension or options. You always get to act with everyone (barring turnovers). In Blood Bowl there is a certainty that a given model can only move so far so you can plan exactly. In DreadBall it’s much harder to be sure because there are many more possibilities and you have to guess what your opponent is going to try to do, as well as whether he will succeed or not. Scoring is very different. In Blood Bowl the pitch is like a Rugby pitch or American (or “real”) Football pitch with a single area at either end where you can score and nothing in the middle. This gives little tactical “texture” to the bulk of the playing surface, and I wanted to change that. Pinching an idea from pinball, I’ve given DreadBall multiple areas on each side of the pitch in which you can score, and they have different values (between 1 and 4) depending on how much risk you want to take. This lends texture and variability to the main body of the pitch and offers a Coach a number of options for scoring in most Rushes. Just so you know, scoring in DB is called a Strike (like bowling), hence the areas in which you can do it are called Strike Zones, the target is the Strike Hex, and the player type that is best at doing this is called a Striker. Overall, DreadBall plays faster and smoother with no “resets” after Strikes. When someone scores in Blood Bowl play stops and all the models are reset on their own side. This allows for a certain amount of planning and positioning and a number of standard plays and set ups have grown up. In DreadBall I’ve gone for a very different model. DreadBall games don’t stop when a Strike is scored. Instead, the ball is immediately relaunched onto the pitch across the centre line. The Strike ends that Coach’s Rush, and so it is now the opposing player’s go, but none of the players are reset. This has a few interesting effects. Firstly it makes the game faster. Moving all the models and then deciding how to redeploy them inevitably takes a minute or two. Mostly this is thinking time for the players, so how long depends on the individuals, but it takes more than zero time. So, here DB saves some time. Having no resets also introduces a new tactical problem to solve. If you run all of your players down the other end of the pitch to swamp the defence and score, as soon as you have done so the ball is behind you and the opposing player has a free run to your Strike Zones. This means that you have to think ahead to where the ball will go if you are successful as well as what might happen if you mess up. This tends to wrong foot new players the first time it happens because it is so different, but it very quickly makes for a smoother and faster game. DreadBall deals with slower teams better. It is possibly a detail most people don’t care about, but I always felt that slower teams lost out in many BB leagues. Dwarfs, for example, can’t score as many times as others ‘cos they’re just too slow. They can often close down the other team too, so overall scores are often low when they are involved. However, when scoring totals get used for tie breakers in league placement they inevitably lose out to fast teams like Wood Elves or Skaven. DreadBall uses a differential scoring system so it is the difference between the scores that dictates winning and losing. This means that even if one of the DB teams was as slow as BB Dwarfs (which none of them are) they would still be in with an equal chance in a league setting because winning by 1 is winning by 1 whether this is 13 points to you and 12 to your opponent or only 1 ever. What is tracked in game, and what matters at the end, is the difference. Incidentally, in DreadBall there is a landslide instant victory if you ever get 7 more than your opponent at any point, and a Sudden Death tiebreak if the game gets to the end of normal play in a draw. There is always a result. There’s a lot more, but you get the idea. Will the Elephant Please Leave Now? I understand why people make the comparison, and it is an excellent shorthand to say that DB is like BB if all you mean is that they are both fictional sports board games. Beyond that, however, they are completely different games. DreadBall is not intended to make people abandon Blood Bowl. It is an alternative that many BB fans will also like, and hopefully will play as well, relishing each for their unique tactical challenges. The DreadBall Kickstarter shows you some more photos of what’s in the box. * In case you aren’t familiar with the term, it’s explained here. This entry was posted in DreadBall - The Futuristic Sports Game, Game Design Theory, Metagame musings. Bookmark the permalink. Interesting read, and thank you for the insight into the thought process behind the game. Thanks for this – I will be dissiminating to the masses. Incidentally, this is an issue that come sup alot with Mantic Stuff – KoW is not Warhammer. I always ask people who say it is if they think that games designer like you hoestly sit down in the morning, crack your fingers together and then try to rip off a different game as your work load. Its a silly image, as Games Designers wouldn’t do that(beacuse of the reasons you’ve mentionned) and I doubt that you get up in the mornings, too. Well designers are people too (no sniggering at the back), and I daresay some take the easy route and just copy things because some people are lazy, just as others are diligent. I’m really just saying how things look to me. The comparisons are frequent and lazy, but they are also understandable. The head of Mantic and the designers all once worked for GW, so there’s an undeniable connection there, it’s just that some people make too much of it. You’re right: entirely understandable (and entirely predictable). sounds interesting! Do you think it’s possible to give us a demo of the game? Maybe a short gameplay video like you guys did for DKH? I’m told that some have been shot already, though I’m not sure what’s happening with them. I’ll chase it up and see what I can find out. Otherwise I’ll have a stab at doing something myself. Sadly, it’s a lazy but easy way to tell people about the game to describe it as “Sci-fi Blood Bowl” — what would you suggest instead? If people know BB then it is a useful reference point as there aren’t many well-known sports games about. Perhaps though, it’s fairer to say something more generic. For example, “it’s a futuristic sports board game”. That way you avoid confusing people with football imagery. If you have to pick a single real sport to compare it to, then the overall vibe is more like the speed and ferocity of a really good ice hockey match (though even that is’t entirely right). Not a show I used to watch, but the wiki description has some similarities. Actually Dreadball is much closer to Speedball2 than to BB. If the person(s) are familiar with tron legacy, then reference the game grid there and extrapolate that its a team game similar to the futuristic setting in the tron movies? 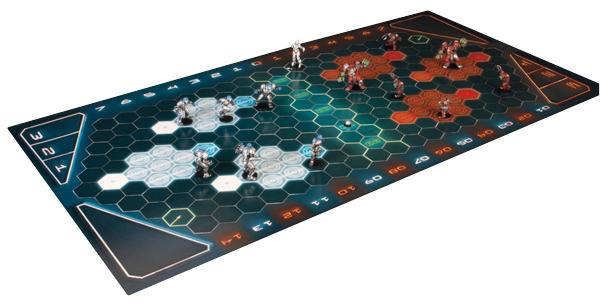 Also ***** cough cough **** additional games could come from Dreadball with different 3-dimensional boards and rules since the setting is there from this game. Allthough jai-alai and moto racing are most likely ruled out due to extreme similarities from other properties which exist “on the grid” already. Jai alai, lacrosse and a bunch of other sports have been part of the inspiration for DB as it stands (as well as pinball, ice hockey and basketball). I saw this linked on Warseer, very interesting read and great to see your perspective on it! Gameplay in Dreadball sounds pretty cool from what you mention here, its the most detail I’ve read in one place so far. Can you tease us a lil’ bit and tell us how many stats per player or stuff like that ? Happy to talk rules, but rather than post snippets in a comment, I thought I’d do some more posts. I gotta hand it to you, Jake, you really are pretty good at this games design lark. DB is truly looking both original and a lot of fun. Game on! DB is less similar to BB than, let’s say, KoW to Warhammer. However, people seems to have far less problems accepting yet another fantasy wargame than yet another ball-based sports game. Also, what I really admire about your game is that you have created a new “sport” while doing it, instead of adapting an existing one to the tabletop. Thanks Rodrigo. It’s sometimes useful for me to try to explain things as it forces me to order what is often a bit of a random and jumbled process. There isn’t an icing rule per se. I thought about it, but is seemed a bit fiddly when sat next to the rest of the rules. I could just envisage having to explain it repeatedly. Also, I’d already decided to make the distance you could throw the ball relatively short because it made for a better game, so it didn’t come up. There are several types of foul though, and a Sin Bin to stick the naughty players in! From what I can tell (without playing it) you can be proud of you new baby. The ice hockey inspiration source might have more obvious than you thought because when I was reading about how you play it and I thought it would require player deployment like hockey straightaway. Hockey is a great game so nothing wrong with using it as a source of inspiration. I realise this is a bit of a “how long is a piece of string” question but how long does a game of DB typically take? The three-hour grind that many BB games turn into has stopped it from ever hitting our gaming table on a regular basis. My original brief was that it should take no longer than 90 minutes, tops. In the event, I kept streamlining and tweaking till a casual game at my normal fairly leisurely pace takes me about 70 minutes (probably including a pause to make a cup of tea). If you are drawn at the end of 14 turns then you play sudden death, which may last another 10 minutes (or 30 seconds, depending…). Most people seemed to be playing in an hour or a few minutes over, so this is not an unusual time. Of course, chronic cases of analysis paralysis will take longer, as always. At the other end, we had a bunch of serious tournament players play a couple of leagues of this and they got very excitable about the speed of the game. They were playing 45 minute games and telling me that this would revolutionise the tourney circuit because you could play so many games in a day. I think my head would pop if I tried to keep up with them, but it’s a nice sentiment. Great article and a truly brilliant game. I was lucky enough to play this at the weekend and have been asked by the powers that be to do a write up about how the game actually plays. I won’t spoilt the read, but I will say this about said elephant: if people try to play this as they would BB, then they will struggle with it, not because it is a bad game – it isn’t (I have not been this excited about a game for years – cheers Jake!) – but because it is a totally different game. I struggled at first as my head naturally went to how BB plays, but after a quick 4 Rush demo, I was playing a full game with Refbot, cards and fans. Thanks JP. I look forward to reading it. It’s entirely appropriate to link JP. I was going to point people to it myself, and still may. As a long time BB fan I think this looks like a ton of fun. Is there a reason why you chose to go with “fantasy” inspired races instead of making up new more sci-fi-ish ones? The races I started with are the ones from Warpath as that’s the Mantic SF universe. It made sense to start with the races they’ve already defined in terms of concepts and models – Corporation humans, Forge Fathers, Veer-myn and Orx (and Goblins). The similarities to BB are inevitable, of course… but the game looks fun and the figures look fantastic! Hi, great article. You mentioned above that the races you chose for the game were from Mantic’s already made Warpath SF universe. Does this mean that future races added to the game will have to 1st see the light of day for Warpath or is DreadBall itself going to be a driver for adding new, never-before-seen races to the Warpath lore/universe? A great read Jake. As an aspiring game designer myself, I love to see the personality and creative process behind the game and not just the final rulebook. Thanks Ross. I’ll be posting a load more on the details of the rules and they whys behind them over the next few weeks. Just a quick question. Was this an original design that you brought to Mantic or an idea that they had that they asked you to design? A bit of both. As I remember they knew they wanted a sports game and had a name (DB) but nothing much else. I knew DB was kicking about as a potential project and nagged Ronnie to let me do it cos I’d been playing with various versions of an ice hockey based game for years and thought it would be a good fit. 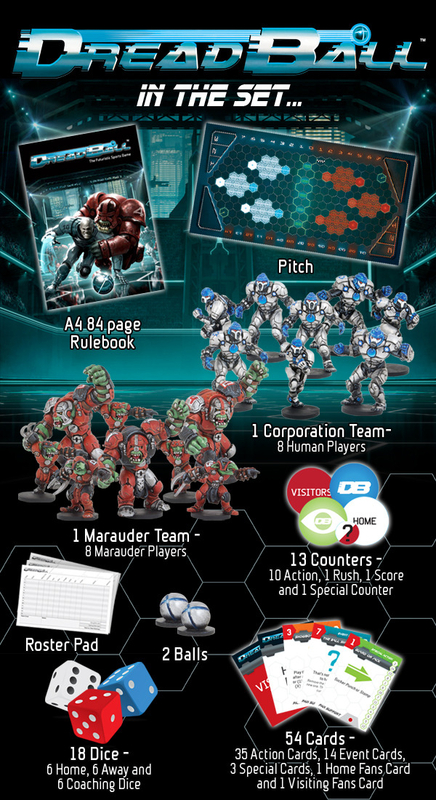 You mentioned that Mantic knew they wanted a sports game and they already had a name, DreadBall. While the game itself was still being kicked around in your head before you were given the opportunity to make it, what did YOU call it, what was your name for the future sport you invented? It never had a proper name. Some games start with a name and grow from there, others struggle to find something that sums them up properly till right at the end. Thinking about my unpublished games, some have working titles and have had for years, others have final names which I am very happy with, and a couple of names have had several games attached to them (none of which have ever really delivered the vision I had attached to the name). One name was on a game from the outset, but felt increasingly wrong and so I changed it after the game was finished. That game hasn’t got a better name yet, but it’s still right to use the original name for something else because it’s just not right for the one it started on. If you see what I mean. Nice work Jake, really looking forward to this! We have a big blood bowl community at our games club and most are up for giving it a spin… A few of us like me are mad for it, and will be getting the lot haha. The no resetting is gonna speed up play a lot, we reckon it will be possible for 9 games a weekend for a tourney, which will make theme excellent value for money too. Thank you for posting this article; it’s really peaked my interest and highlighted DB as something new and different. I’ve played BB for over 25 years now, starting out with the venerable card version in the 80’s and through each incarnation up to the present, so I feel fairly qualified to say DB seems to have a very different vibe: I love the idea of continuous play! Thinking on your feet and responding effectively over the same, safe strategy every turn? Yes please! It puts me in mind of Speedball 2, an old Amiga game by the Bitmap Brothers: that’s nothing but a compliment, SB2 was utterly wonderful. I’ll follow this with interest; could be the beginning of something big! Good stuff, Mr Thornton. If BB is the elephant in the room, any thoughts about the pachyderms in the corner – Grind, Elfball, Killball among others? Like the idea of not setting up again, that’s quite a cool one. I know of them, but I don’t know them, if you see what I mean. I do know, however, that they sadly fall into a category that doesn’t get much by the way of complements – the BB clones. One of the reasons why I wasn’t interested in going down that road. They may be great games – I have no idea. What I do know is that they’ve been out for a while and in all my travels in the gaming world I have yet to meet anyone who plays any of them. They would therefore seem to fall under reason (1), above. Okay … just for record as someone who owns Elfball and has competed in several organized tournament events in the UK for it. Its is definitely not a BB clone … no more than Dreadball which looks great. Played on a hex pitch just like Dreadball, totally different movement rules, total different defensive strategies and teams are balanced completely across player types. I think the only reason its not played more is because the company that makes it is so small and just could not afford mass distribution publishing (like Mantic can). I’m looking forward to getting Dreadball … but since you felt the need to defend Dreadball as an non-BB clone … I could not help stepping up and saying that suggesting that Elfball is a BB clone is waaayyy off. Its just too bad its published by such a small company. Such is the nature of rumour. As I said, “they may be great games – I have no idea”. It sounds interesting and I’ll have to add it to my ever-growing list of things to explore. As I mentioned earlier, I anticipated this comparison being a problem which is why I wrote the article. I don’t think it’s just being small that is the problem here. Mantic is not huge. I think that the issue is one of understanding the marketplace and then engaging with the community so you can explain stuff to them properly and help them understand what you are offering, One of the comments mentioned how expensive proper community management is, and my experience would suggest that this is more likely to be the issue than the size of the company. One of my first thoughts was similarities to Elfball as they also use the term “Strikers”. Thanks for the replies – if you ever do actually want an intro to Elfball, there are a few super-enthusiasts scattered around the UK who are happy to oblige. Good luck with DB! That would be fun. It’s always better to learn from someone who knows a bit about the game. To be clear … I believe that you’ve never seen Elfball before … its just interesting that the two games made by former guys working on the rules for BB took very similar takes seperately from each other to make their own game in this genre. It is interesting. Who designed Elfball? I look forward to giving it a go (after this excitement has died down and I get some time to game again). Tom Anders. He served on the Blood Bowl Rules Committee at the same time you were on it. I might have forgot another similarity between the two. Does Dreadball start with a face off at center field. If so … Elfball does that as well. The graphics I’ve seen looked like it does but I could be wrong on that. I remember Tom. Like I said, I’ll give it a go and see what I think. DB does start off with the teams facing each other in the centre, but then so does pretty much every other team sport. It’s not got one from each side and a ball dropped in the middle though, if that’s what you mean by a face off. The ball is launched on from the side like every other time. Speedball 2 is one of those odd confluences you get in design. I’ve never played it, and had indeed never even heard of it till we had a DB day and several of the playtesters asked if it was the inspiration. As I know so little about it, I can’t really discuss it very effectively. All I know is that people tell me it’s a bit like DreadBall. I enjoyed the description immensely. Point of fact, when I first read the Dread Ball description, the first question that came to mind is ‘how is this different from Blood Bowl?’ The second thought that came to mind is that I have wanted a game of this sort for a long time. I tried to scratch the itch with Grind, but I’m still not sure that satisfied…maybe I’m hoping for a more elegant rules system. I look forward to playing! To be honest, the biggest drawback for me is how blatant the corporation models are trying to be ‘not space marines’. One could argue all day about the armour (and rightfully so– it is pretty generic) but the helmet is clearly intended to look like a standard space marine helm. No one could argue with a straight face that that isn’t the case. Even if it weren’t intentional, it’s so obviously similar to an iconic design of the most popular wargaming company that someone along the way would have nixed it if that wasn’t the intention. For me, about the only unusual thing in a Space Marines armour is the impractically huge shoulder pads. Apart from that they’re not really any different from medieval suits of plate. There are, after all, only so many ways you can plate a person and still allow them to move. You are right that the grill on the front is reminiscent of a Space Marine’s helmet, but the detail of the whole is very different. I’m not sure if you have enough pictures to see, but it looks like it’s built up starting from one of those old fashioned American Football helmets, with an extra face mask as protection. Of course, if you don’t like them then that’s your choice. They can’t suit everyone. i’m not going to defend Mantic’s design choices when it comes to helmets, all I say is that far FAR too many people attribute things to GW that they never invented, or that are utterly generic. A basic Mk7 space marine helmet is pretty generic in terms of helmet designs. It has eyes and a mouth grill. It is only iconic to people who only know space marines, or selectively ignore pretty much every imperial trooper’s helmet from the star wars franchise (of which GW clearly took inspiration for their space marines). Darth Vader’s helmet is basically a space marine helmet with a flange around the bottom. For that matter, Japanese anime has had decidely ‘space marine esque’ helmets on troops and/or mecha since before Star Wars. The Transformers (all of which were originally designed in Japan) also display many examples of space marine esque helmets/heads. A Space marine helmet is basically a fully enclosed combat helmet with individual lensed visors and an integral rebreather. These are hardly originaly concepts, nor particularly creative. The original Womble marines had a far more unique helmet; the so called Mk6 ‘beaky’ design, but that went out of favour fairly quickly and was replaced with the far more star wars generic helmet of the Mk7. *googles* Ha, you’re right. Well the originality or lacktherof in scifi headgear is even clearer now. Humans haven’t changed shape in a while, and still articulate in all the old, familiar places, so plating them in rigid armour will keep coming back to the same basic forms. If you look at most fancy helmets, for example, the fancy bit is just something stuck on top of a basic shell,, and there are only a limited number of ways to make that shell. It’s a bit like old Star Trek aliens who were almost always just a human with something stuck on their head (and a bit of makeup). I think it’s obvious now that sci-fi/fantasy miniature sports games are a genre of themselves. Look at the sheer volume of non-GW Bloodbowl type models made by various companies. It’s a genre. GW just got their first. I loved this game so much when I was growing up. Can you tell us a little bit about what the future plans are for this game. Is it seen as a one off or something you guys want to support goign forward? Oh this isn’t a one-off – not if it’s half as popular as we think it will be. There are lots of ways we’ve thought of to expand the game, we just haven’t entirely decided on the best ways yet. Partly this depends on the success of the Kickstarter. The better that does, the sooner we’ll be able to do more extra stuff and the more I get to do what I want in the way of extra goodies. Yay! This is exactly the breath of.fresh air I’ve been waiting for, blood bowl is the game that got me into the hobby but my love of fantasy stuff lies with the sci-fi end of the scale. So seeing this new awesome game has made me as happy as a fat kid in a sweet shop. Massive kudos for you :-). Never mind the comparisons to GW and their football game, “Dreadbowl” looks like a fun system and should provide a more than welcome respite from the endless games of 40K at my local club. Love the variety of teams available in this system and I intend to field more than one human team if we get a league up and running at the aforementioned club. Just have to wait for this to be released to the public, then the sci-fi equivalent of Port Vale FC can take to the pitch! (Or should that be table)? * Hooray for hexes! Squares are better if you are moving mostly forward and backward. Played a lot of BB starting with 2nd edition which was Blocking: the Board Game. (Later editions have tried various ‘band-aid’ fixes to get around this inherited problem.) Good idea to start afresh. * Any direction, no reset? Sounds like a good way to keep things moving. Also the only Judge Dredd story I’ve ever read: … PingBoing, was it? Low budget Mad Max feel – shot in the Australian desert but no car chases. Should warn that I remember the game, but I don’t recall the film being very good! Oh, and a low-tech timekeeping method. Salute of the Jugger sounds vaguely familiar. I don’t think I ever saw it, but friends gave me pretty much that summary when it came out. I agree with everything you say there, its not a clone, but I think the ELEPHANT is undoubtably the races and their design. If it was a just a new sci-fi game, then why not have strange aliens rather than equivalent of Orcs and Dwarves and Ratmen etc etc. So unless I missed something that addressed this, the elephant is still standing right next to us. 🙂 The visual design choices may not have been yours, but its obvious to everyone I’d think that the attempt to say things like “we wanted it slick and futuristic” etc were of course a way of distracting from the elephant and trying to gird against IP lawyers. The skin that has been skin laid over the mechanics just hits you between the eyes like an Orc charging down a pitch. I still reckon its cool mind you, and Blizzard have already gotten away with borrowing from GW, so all the best. I reckon its going to be great and I really look forward to it…. but, yep…. there’s that elephant. The four initial races were determined by the four available races for Warpath, the pre-existing universe in which Dreadball is set. The season 2 teams are able to go beyond this and are the types of alien races you say should be in the game. No amount of IP lawyering could stop a company releasing an exact Blood Bowl clone if they wanted to, that isn’t how copyright or trademark laws work. Tune in for DreadBall Season 2, featuring four all-new weird and exotic alien species! The tall, skinny, pacifist, but highly skilled Judwan! The imposing, savage, insert-like Z’zor! The confusing and transforming robots! An interesting take on things, nativeflame, though I don’t entirely agree with you. I talk about this at some length in the Meeples and Miniatures interview I did (podcast 93 I believe), but basically it’s archetypes that people buy into and allow folk to get to grips with the core game. Once they have their feet under the desk you can go weird (as I am doing). If you start out with weird then you are basically guaranteed not to do as well. Also, as has been said before many times, GW invented exactly none of these archetypes. From a gamers point of view, I’m wondering about the similarities to BB in terms of the actions you can take. Having a brief look through the rulebook, it seems like the actions are predominantly the same. You are trying to slam the other players (block), pick-up/throw the ball, you have to evade (dodge) to move out of adjacent spaces and there’s even a dash (go for it). Most of the basic actions seem very similar. I’m interested in picking up a copy (especially since there’s such a huge community interest), but I’m still kinda feeling that it’ll play very similar to BB (except faster since there are less players on the field). Is there anything that changes the way it plays out? 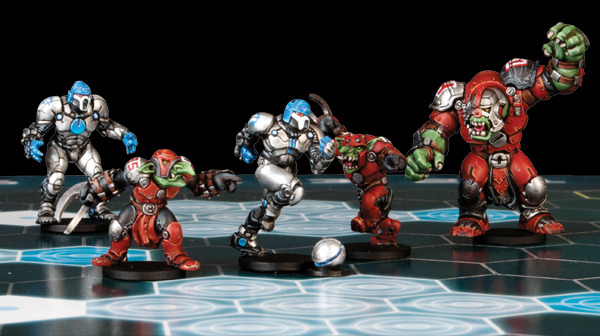 DreadBall is completely different to Blood Bowl on the tabletop. Monkey’s Blood and JM have explained some of the differences below, and there are loads more. Your comparison is misleading. I use a stick to knock a ball about in a sport called hockey. I do the same in golf, but it’s not the same game. Rugby isn’t American Football either, though a simplistic description of them could be identical. At that level many sports are the same as each other, yet they plainly aren’t in reality. To expand on the comments already made (and to pick only one of many features) the management of action tokens allows a very different tactical nuance in DreadBall as the options are vastly increased. If you read my earlier posts on this, and look at the gameplay video and pdf you will see what I mean. You have fewer actions than you have players, so not all can act in every Rush. If you choose, an individual player can act twice in a Rush, but then this further reduces your pool and someone else must miss their chance. 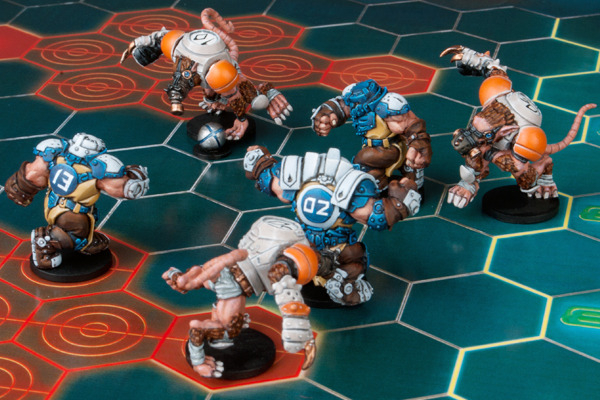 This is a core game play feature in DreadBall which is entirely absent from Blood Bowl where every model can move every turn and there is no thinking required. You have to consider the order you will act in both games, but the decisions on who will act within a turn (ie resource management) is only found in DreadBall. There are many, many other differences, all of which accumulate to make a completely different playing experience. So yes, whilst both games allow you to pick up the ball (as you can in the near identical games of basketball and American football) and block opponents (ice hockey and rugby) or score points (soccer and water polo) those similarities are superficial and the game play – and more importantly the decisions you need to make and the things you need to consider – are very different. Blood Bowl is about risk management – a failure will cost you the turn (and potentially worse). Dreadball is more about resource management, where you have limited actions but you’ll always be able to take all of them unless you spill the ball (which always ends your turn). The specifics are very different, too. Players (as in models) can take more than one action a turn. Slams are more effective if they start off with some distance between the target and the slammer, so prepositioning is a good idea. And of course, the dice mechanic (numbers of dice rather than a single D6, or the dread block dice!!) means results are a little bit more predictable. Las comparaciones son inevitables pero para mi la gran diferencia es que el juego no se detenga tras anotar… Me gustaría saber si también hay heridos, inconscientes…y como entran al campo si el juego no se detiene. Muy interesante…para todos los aficionados al Blood Bowl. Pingback: DreadBall Endgame and the Warpath Future?